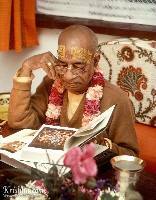 About the editing of Srila Prabhupada's books. To this day, almost forty years after the passing of His Divine Grace A. C. Bhaktivedanta Swami Prabhupāda, confusion still reigns among some devotees about his desires and instructions regarding how he wanted his main legacy, his transcendental books, taken care of. Thus some devotees continue to express doubts regarding the posthumous editing and correcting that have been done on Śrīla Prabhupāda’s books by his publishing company, The Bhaktivedanta Book Trust. Although the BBT strives to make its books as “clean” as possible, alert readers continue to find genuine editorial errors in BBT books. In particular, BBT translators, who minutely scrutinize the English books, often uncover mistakes. Since the BBT now publishes Śrīla Prabhupāda’s books in nearly ninety languages, you might be interested to know what Śrīla Prabhupāda said about the editing of his non-English books. It is worth noting, perhaps, that the non-English books are translated from the English ones. If the English ones have errors, the non-English ones are likely to repeat them. Publishers revise their books. It’s standard practice. You don’t perpetuate mistakes. You fix them. Especially when the mistakes are your own (the publisher’s own), not the author’s. And when publishers make corrections, they don’t litter the page with little footnotes to tell you where all the goofs were. The mistakes simply disappear, with the corrected text in its place. The words adi vani are Sanskrit. According to the Monier-Williams Sanskrit Dictionary, adi means “beginning” or “first,” and vani means “sound,” “voice,” “words,” “literary composition,” and so on. Sometime around 2003, a group of “Hare Krishna” people began using the term to promote their editorial views about the books of His Divine Grace A.C. Bhaktivedanta Swami Prabhupāda, Founder-Acharya of the International Society for Krishna Consciousness. The term never appears in Śrīla Prabhupāda’s books, and we have no evidence he ever used it. Śrīman Rūpānuga prabhu (ACBSP 1966) has recently distributed a short paper called “A Scientific Method for Evaluating Editorial Changes to Śrīla Prabhupāda’s Books.” As I am sure many others were, I was intrigued by the title and the topic. The editing of Śrīla Prabhupāda’s books since 1977 has been a hot topic in recent years, and the emotions roused have generated a fair amount of heat in the direction of the BBT. "Why there should be mistakes?"